If you live in Toronto and are considering chimney tuckpointing there are some important things you need to know. Your chimney provides warmth to your home on the coldest nights, and it also adds aesthetic appeal and monetary value. Chimneys are great and they can’t be ignored, in fact all chimneys require some TLC from time to time. Keeping up with regular maintenance will help put off costly repairs. No matter what, eventually mortar joints will need fixing at which point tuckpointing might be the most affordable solution. Tuckpointing is the process of fixing damaged mortar joints. This damage occurs due to harsh weather or exposure to excessive amounts of rain. Moisture can be very destructive and is even capable of damaging rock masonry. Weakened mortar joints let water seep right on in, thus creating a whirlwind of problems if left untreated. Tuckpointing involves completely removing the damaged mortar joint portions, and refilling this space with new mortar. A key component of this process is finding mortar that matches exactly to pre-existing mortar, otherwise you get a patchwork- look and you actually risk the overall stability of a structure. You don’t want to use mortar that is stronger or weaker than the original mortar. Sometimes tuckpointing is necessary and very beneficial. Bricks can last hundreds of thousands of years but mortar has a much shorter lifespan. Mortar typically lasts around 25-years, give or take a few years depending on local weather conditions and overall exposures. 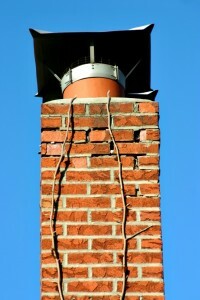 If chimney mortar joints appear crumbly, cracked or overall weak the cheapest solution is usually tuckpointing. Your other alternative is to do nothing, simply wait until the entire chimney structure deteriorates and collapses. Trust us, tuckpointing is a lot cheaper than rebuilding your entire chimney from scratch. Routing out all of the old, damaged mortar at a uniform depth. Using compatible mortar to fill in the newly made holes. Using a special tool to create thin strips along the middle of the mortar in order to create grooves. Using properly matched mortar color to fill in the pre-sliced grooves. The process stops the mortar joints from further deteriorating, as they would without tuckpointing. Stops the structure from losing stability, leaning or completely collapsing. Stops water from penetrating into chimney walls and accessing the space between the chimney and the flue lining. It is here that water can create a world of unseen issues such as mildew, rotting wood, or mold. If this is happening you may notice stains on the ceiling or wallpaper from a build up of moisture. Save money by taking care of small tuckpointing repairs early on before more expensive damage has a chance to form. When your chimney is restored to its original condition your home value improves. The law protects historical buildings so that all repairs must be properly recorded and conducted to a strict set of regulations and standards. Since almost every single historical building has some form of brickwork tuckpointing is a common necessity from time to time. A nearly identical match to the original mortar must be prepared in order to maintain the original appearance of the building. Each and every change must also be carefully documented so as not to be confused as original historical work. When Is Tuckpointing A Bad Idea? Tuckpointing is only an option before chimney damage becomes too extensive. If bricks are spalling, or the chimney is tilting one way, tuckpointing is no longer a viable solution and a full or partial rebuild may be necessary instead. You can reduce exposure to water, which chronically damages mortar and bricks, by protecting your chimney, for instance by installing a cricket. A cricket is a compact diversion roof that attaches over the chimney and prevents water from constantly pouring down and soaking the chimney. Keep mortar clean of things like moss, weeds, or mold. Address mortar damage the moment you notice it before it has a chance to spread. If you are concerned about the appearance of the mortar holding your brick chimney together call Toronto’s number one choice for all masonry services, Turnbull Masonry.